Thank you for all of your support and for continuing to stand with me and my coworkers as we fight for good family sustaining jobs at UPMC. Yesterday we celebrated the decision from a federal administrative judge who ruled that the way UPMC Presby-Shadyside has been treating me and my co-workers is illegal and that me and 3 of my co-workers must be reinstated and given back pay. 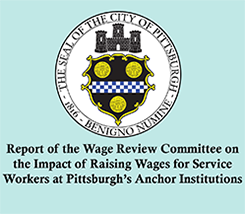 We were joined by City Councilwoman Natalia Rudiak, City Councilwoman Deb Gross, State Senator Matt Smith and State Representatives Dan Frankel and Ed Gainey, along with community supporters from all over Pittsburgh. 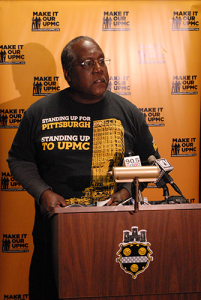 When UPMC fired me for the first time, I felt like there was no way I could stand up to UPMC and win. But with your support and the support of my co-workers, we fought back and won. That’s why when UPMC fired me for a second time I knew that what it did was illegal and that if we stood firm in our resolve we would be vindicated. I was right. 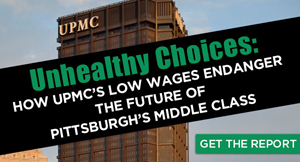 This is a major victory and step in our journey towards holding UPMC accountable. We need your support and solidarity now more than ever as we call on UPMC to put an end to its illegal campaign of harassment and intimidation of its workers. We need to know the community won’t back down in calling on the employer to stop its legal games and start working with us to improve jobs for our families. We know that the fight isn’t over. And together we will continue fighting until UPMC does right by our city. Together we can make it our UPMC.